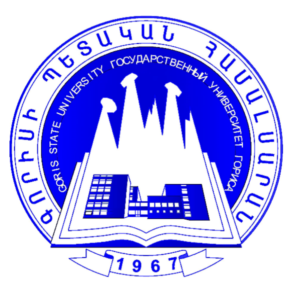 Established as a branch of ASPU after Kh.Abovyan in 1967 and being the only leading higher education institution in Syunik region of RA, Goris State University (GSU) has been retaining and implementing its mission of preparing skillful and competitive specialists for educational, economic and other various fields of the region for already half a century. The university celebrated its 50th anniversary in October, 2017. A two-cycle educational system is being implemented at the university (Bachelor’s (first cycle), Master’s (second cycle), by introducing the European credit accumulation and transfer system and ensuring the inter-institutional and intercultural relations in line with the Bologna provisions. The management of the University is carried out by the University Council, the Academic Council and the Rector. GSU has all the respective structural subdivisions to ensure the adequate implementation of the educational process: a library, a QA and Carrier Center, an IR and Projects division, a PR and Media division, Student Council and Student Scientific Society a dormitory etc. Several computer laboratories and research centers have been created in the result of the implementation of international projects and cooperation with the local partners /the laboratory of Electrical Engineering, the GIS lab, a classroom of Inclusive education, University-Enterprise Cooperation Centre etc. The number of the academic stuff employed at the university is about 100, among whom 8 Doctors and Professors in Science, 32 PhD and Associate Professors and 57 Assistant Professors and lecturers. The number of the students at GSU comes up to approximately 1400. The university has three faculties: the Faculty of Natural Sciences, the Faculty of Humanities and Social Sciences and the Faculty of Economics and Engineering and 9 chairs: Chairs of Armenian Language and Literature, Economics, Pedagogy and Psychology, Biology and Chemistry, Mathematics and Informatics, Electronics and Electrical Energy, Foreign Languages, History and Law, as well as the Sector of Physics. The education is realized in 14 specialties through Bachelor’s and Master’s education programs and full-time and correspondence courses. The Bachelor’s education program is implemented for the specialties in Mathematics, Pharmacological Chemistry, Law, Armenian Language and Literature, Primary Education Pedagogy and Methodology, Electronics, Electrical Engineering, Management, Enterprise Economics, History, Physics, English Language and Literature, Fine Arts and Management (based on the field of study). The Master’s education program is implemented for the specialties in Mathematics, Law, Armenian Language and Literature, Pedagogy and Methodology, Economics, History and Chemistry, Special Pedagogy and Tourism Management/correspondence courses/ . Since 2012 GSU has been a partner university in different Tempus and Erasmus+ projects such as “University – Employer” (ARARAT), Access to Society for People with Individual Requirements (ASPIRE), Building capacity for University-Enterprise partnerships towards competency based training in Armenia, Georgia and Ukraine (Cap4Com), Master in Higher Education Management: Developing Leaders for Managing Educational Transformation (MAHATMA), Library network support services: modernizing libraries in Armenia, Moldova and Belarus through library staff development and reforming libraries (LNSS) and Higher Education interdisciplinary Reform in Tourism management and Applied Geo-information curricula (HERITAG). In the field of scientific activity GSU has expanded the field of collaboration with scientific and scientific-pedagogical institutions, holds and participates in various conferences and has publications in national and international journals.